Club 33 caters to VIP members with luxe digs and indulgent menus. Down a quiet street in the New Orleans Square section of Disneyland, far from the mouse-riddled streets of Downtown Disney, sits a secret clubhouse. This is no offshoot of the famed Mickey Mouse Club, though, nor is it a place to spot princesses eating breakfast. Instead, it’s an ultra-exclusive restaurant and bar for the Disneyland elite, possible investors, visiting dignitaries, and, of course, celebrities. Club 33 is a meeting place for the rumored 500 members willing to pony up $25,000 for membership fees, plus $12,000 a year in dues for the privilege of eating and drinking in the shadow of Sleeping Beauty‘s Castle. The speakeasy is not a new addition to the park. In fact, it was developed by Walt Disney himself and decorated with antiques and a French elevator chosen by Disney and his wife. 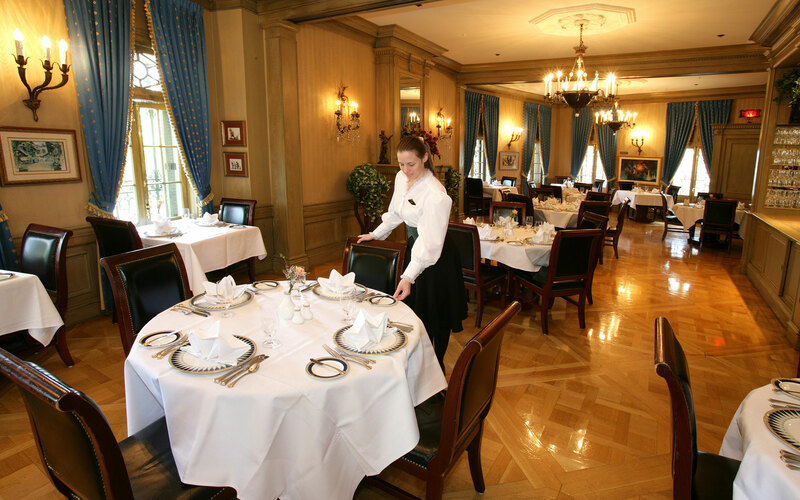 Disney envisioned Club 33 as a place for VIPs to meet and greet far from the maddening crowds of Main Street U.S.A. The club officially opened in 1967, five months after Disney’s death, and has been hosting the Disneyland one percent ever since. While Disneyland has some big changes planned for the years to come, it’s unlikely that Club 33 is going anywhere. The concept has even spread from California to Japan, with a sister location in Tokyo Disneyland. According to fan site Disney Dose, which managed to score an invitation, Club 33 is lavishly decorated, filled with lush furniture, chandeliers, stained glass, and dark wood. There’s also a harpsichord that’s been played by both Paul McCartney and Elton John, according to the website Vine Pair. There’s a courtyard called the Court of Angels, an extensive wine cellar, a jazz club lounge featuring a hand-carved wood bar, and a main dining room serving a French Nouveau menu that includes items like sassafras-dusted duck breast, butter poached lobster, and flaming vanilla crème brulee (at least at the time that Disney Dose went for a visit). While the prix-fixe meal costs $100 per person, unlimited dessert is reportedly included, proving that the restaurant could be the happiest place inside the Happiest Place on Earth. Because this is a Disney property, there are nods to the Magic Kingdom throughout, including a talking vulture perched on a grandfather clock in the reception area, original Disney artist drawings, and fanciful fairytale-filled artwork. Unfortunately, most people will never be able to see the inside of the club. The membership is limited—rumored to have a waiting list with more than 800 names. While in past years, members had passes to share with friends, in 2015, Disneyland changed the Club 33 policy last year, and now only the member and a spouse or domestic partner can access the club benefits. Luckily, it’s possible to take a tour on YouTube and through fan photos.